Peace Corps Online: November 24, 2004: Headlines: Staff: Journalism: Television: Village Voice: A few weeks ago, Bill Moyers, the venerable face of progressive current-affairs analysis on television, warned that the next four years were set to be a golden age for Watergate-style sleuth reporters. "I just think every time you wed the state and business together like this, you get corruption flowing like the Mississippi River," he announced on his PBS series, Now. November 24, 2004: Headlines: Staff: Journalism: Television: Village Voice: A few weeks ago, Bill Moyers, the venerable face of progressive current-affairs analysis on television, warned that the next four years were set to be a golden age for Watergate-style sleuth reporters. "I just think every time you wed the state and business together like this, you get corruption flowing like the Mississippi River," he announced on his PBS series, Now. Peace Corps Online: Directory: USA: Special Report: Peace Corps Deputy Director Bill Moyers: November 24, 2004: Headlines: Staff: Journalism: Television: Village Voice: A few weeks ago, Bill Moyers, the venerable face of progressive current-affairs analysis on television, warned that the next four years were set to be a golden age for Watergate-style sleuth reporters. "I just think every time you wed the state and business together like this, you get corruption flowing like the Mississippi River," he announced on his PBS series, Now. A few weeks ago, Bill Moyers, the venerable face of progressive current-affairs analysis on television, warned that the next four years were set to be a golden age for Watergate-style sleuth reporters. "I just think every time you wed the state and business together like this, you get corruption flowing like the Mississippi River," he announced on his PBS series, Now. few weeks ago, Bill Moyers, the venerable face of progressive current-affairs analysis on television, warned that the next four years were set to be a golden age for Watergate-style sleuth reporters. "I just think every time you wed the state and business together like this, you get corruption flowing like the Mississippi River," he announced on his PBS series, Now. Ironically, Moyers himself isn't sticking around to partake in the coming "bonanza for investigative journalism" he predicts. 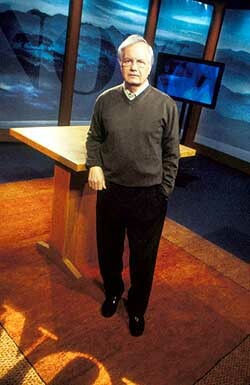 Although he's one of the few living media commentators whose folksy manner and heady background (he served as both a Baptist minister and a press secretary to President Lyndon Johnson) could conceivably bridge the gap between red state and blue state, secular and religious, Moyers is planning to retire from Now on December 17. Moyers turned 70 this year and insists that he's leaving to write a book about Johnson. Still, the timing is fraught with resonance. Considering that reverberations from Rather-gate may encourage anxious self-censorship in network news shows, television needs critical voices more than ever. Now will continue into the new year with Moyers's handpicked protégé David Brancaccio, the 44-year-old former host of NPR's nouveau-business show Marketplace, taking over. But the show itself is being cut down from 60 minutes to just half an hour, and its liberal but rigorously fair coverage (which often includes interviews with conservative thinkers) is now squeezed into a Friday-night lineup that includes right-leaning programs like Tucker Carlson: Unfiltered and The Journal Editorial Report, hosted by The Wall Street Journal's Paul Gigot. Brancaccio faces a daunting task stepping into Moyers's shoes: He has neither the authority or cultural currency of Moyers, and he knows it. "One of us was the right-hand man to a U.S. president, one wasn't," he explains over the phone. "One was the deputy director of the Peace Corp when he was, like, eight years old, and one wasn't," Brancaccio jokes. Being on Now, he says, feels like "somebody stuck you in an episode of The West Wing, only it's real. Everyone here is overly briefed, overly articulate, and�here's the key�trying to change the world." He pauses for breath before continuing. "I am trying to change the world, only with a note of irony." Brancaccio believes that's one of the reasons Moyers invited him to join Now, this ability to speak to a younger generation in its own semi-ironic tongue. After Jon Stewart appeared on Now last year, Brancaccio says, "Bill was totally won over; he saw the crucial role of Stewart's discourse. So I didn't have to make that argument when I came on board. There's got to be a place short of Jon Stewart to do serious journalism on television, a way to evoke the way you talk about issues with your friends. It has to be dosed with the irony of the situation but also be intellectually rigorous and plainspoken." Brancaccio doesn't come off as the world's hippest guy, or the funniest. But he's clearly hoping to bring some of NPR's lighter touch to PBS, and points specifically to his own involvement in Marketplace, a successful show that took liberal-arts majors and put them on the business beat in order to provide a side order of cultural insight with the commerce report. Brancaccio also wrote a book called Squandering Aimlessly: My Adventures in the American Marketplace, in which he traveled around the nation trying to capture ordinary people's views on money and values. Spending more time on the road with a camera crew is one of Brancaccio's key aims for the upcoming Moyers-free season of Now. After the recent election, bow-tied talking head Tucker Carlson complained on his new PBS show that pundits don't represent America well enough and called for "affirmative action" for the media. Brancaccio chuckles at the notion. "Or maybe we should all leave these cloistered hermetically sealed newsrooms and go talk to some people!" Now has been a focus for right-wing ire from the start. Moyers infuriated the right after the 2002 congressional elections with his take on the Republican mandate: "If you liked the Supreme Court that put George W. Bush in the White House, you will swoon over what's coming. And if you like God in government, get ready for the Rapture." Using the Corporation for Public Broadcasting, a body that provides funding to certain PBS shows, the right seems to be enforcing "balance" by financially supporting a raft of new public-affairs programming. Along with Tucker Carlson: Unfiltered and The Journal Editorial Report, there's a series co-hosted by "family values"-defending culture critic Michael Medved in the works for late 2005. The CPB was originally created to buffer PBS from political pressure, but some of the recent appointees appear blatantly partisan, such as Gay Hart Gaines, who chaired Newt Gingrich's political action committee, and Cheryl Halpern, clearly introduced to be some kind of watchdog. During the November 2003 Senate Commerce Committee's confirmation hearings for Halpern, Senator Trent Lott blasted Moyers's post-election commentary as "the most blatantly partisan, irresponsible thing I've ever heard in my life, and yet [the CPB] has not seemed to be willing to deal with Bill Moyers and that type of programming." Halpern responded: "The fact of the matter is, I agree." For his part, Moyers didn't hide his feelings about the new blood at the CPB, dubbing the new appointees "ideological warriors" and telling writer Ken Auletta, "This is the first time in my thirty-two years in public broadcasting that C.P.B. has ordered up programs for ideological instead of journalistic reasons." PBS president Pat Mitchell tried to make peace this summer, defending Moyers's First Amendment right to express his opinion, while noting that the network must be "all the more vigilant about ensuring balance and objectivity in this role as host and interviewer," according to the public-broadcasting magazine Current. "Balance" and "diversity" have long been watchwords at PBS, but they have come to mean something very different from gender or ethnicity: These days diversity seems to mean making sure you have enough white Republican males on board to dodge accusations of being too liberal. Just how many conservatives does it take to balance out one wily progressive? And now that Moyers is gone, do they really need all this firepower to balance out . . . David Brancaccio? This so-called "rebalancing" of the news media is clearly the latest front of the culture wars. "The right is on a long march through the cultural institutions one by one," argues Jay Rosen, chair of NYU's journalism department and author of pressthink.org. But he also believes that PBS's effort to incorporate different political perspectives is a positive move. "I'd actually like to see an even broader range of voices, not just the standard ones. If PBS really wants diverse voices that don't find a foothold on commercial TV, why not a libertarian show? And how about a communitarian show!" Of course, if the American public really is more conservative than many East Coasters realized, then it makes sense�both practically and philosophically�for a public- broadcasting station to broaden its programming. "It's all perfectly rational," argues Richard Wald, a professor at Columbia's Graduate School of Journalism and a former senior vice president of ABC News. "The networks look to reality TV for ratings, and PBS looks to different constituencies for its numbers." Now it's "looking to conservatives," he says, to expand its range of viewers and donors. On the other hand, if PBS is to fulfill its original mission of providing an alternative to mainstream media, it'll have to do more than provide an additional platform for the same faces already ubiquitous on commercial networks and newspapers. Moyers's departure from PBS is a poignant moment. Like that other great homespun PBS icon, Mister Rogers, Moyers represented a kinder, gentler view of this country. He earned Middle America's trust over the last 30 years with his series on topics like the Bible, alternative medicine, poetry, and death. And as Jay Rosen points out, "It's definitely the end of an era, because the kind of liberalism he came out of does not exist anymore." Moyers has sometimes been accused of being preachy (that Baptist minister background, maybe) but his aim has always been clear: to reach beyond the converted and speak to the mainstream. In the last year, though, he has given a number of lectures designed to inspire the next generation of activists and investigative journalists. Brancaccio, meanwhile, seems well aware that he's working in an ideological minefield. 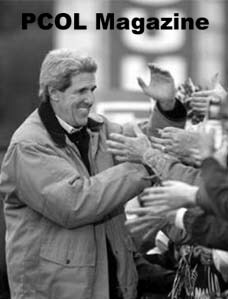 Although his style is less strident, he vows to carry on the Moyers style of "unflinching journalism," as he puts it. "Bill is a journalist at heart, but he has life experience that allows him to say, 'I have all this experience, and here's my conclusion I'd like to share with you.' I would rather bring people along with me on the journey and say, 'I have a question you probably have, let me go out using our resources and see what's up, and we can all figure out what's going on.' "